Protective styling generally refers to…you guessed it…protecting your natural hair. Since afro-textured hair is actually pretty fine (for the most part) and fragile, it needs a break every now and again. Protective styles protect your ends from the elements and from drying out. Crochet braids are my favorite go-to protective style. They are easy to do and (most importantly for braids) easy to take out. And individuals with practically any length hair can wear them. Bonus: they take less than half the time to put in than traditional box braids, micros, or Senegalese! PLUS, you can try a variety of styles with crochet. Crochet braids are not to be confused with tree braids, which take a little longer to put in. Basically, your hair is in cornrows, braided all the way back. If your hair is long, your ends are tacked up. There are two basic options after this process is done. 1) You may choose to crochet synthetic/human hair bulk hair through your cornrows or 2) crochet pre-braided strands (essentially can have the same effect as micros or Senegalese under this option). Using a crochet pin, which can be purchased at any beauty supply store for less than $3 (typically around $1.99), you crochet individual strands through the cornrows. The entire process should take between 3 – 5 hours. Obviously, the slower you are at braiding cornrows, the slower the entire process. How long do crochet braids last? Crochet braids can last anywhere from 4 – 6 weeks, depending on how quickly your hair grows. My hair grows fairly quickly so if I use pre-braided strands I will take them out after 4 weeks. However, if I use bulk hair, especially a type that is pretty close in texture and style to my natural hair, the new growth is less noticeable and I will leave it in for the full 6 weeks. Below is the finished product using Freetress Water Wave bulk hair in colors 1B and 30. To achieve this look you will need about 2 – 3 packs of 22″ cut in half. As you can see below, my natural hair is about as wispy and curly as the synthetic. If synthetic bulk hair is used, daily hair care is essential in order to prevent dryness and fraying. For the style above, I used a daily leave-in moisturizer (both a cream and a spray) to keep the curls lustrous and bouncy. For my scalp, I used coconut oil every other day–just follow the natural tracks of the cornrows. To prevent itch, I used Shea Moisture African Black Soap Dandruff & Dry Scalp Elixir (pictured below). 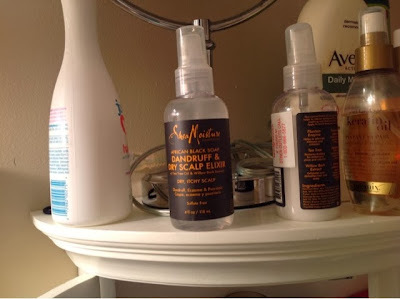 This combination worked pretty well as it did not create a lot of buildup and I could go two weeks without washing my hair. I followed my regular shampoo and conditioning regimen when I did wash my hair, with the exception of blow drying. You can get crochet braids wet at anytime, and they dry fairly rapidly–just keep in mind that your real hair cornrowed underneath will take a little longer to dry. To speed up the process, you may use a handheld blow dryer with a diffuser to get some hot air directly to the cornrows. One of the more attractive features of crochet braids is that it is a cinch to take out. Literally. All you have to do is grab a pair of scissors and cut. No, really, it is that simple. You know exactly where your hair is–it’s in CORNROWS!!!! So all you have to do is cut all the synthetic hair off and start undoing your cornrows. Voila! No fuss, no muss. It should take you well under an hour to finish as long as you didn’t make your cornrows too thin (I usually have only 12 cornrows across my head). If there’s information I left out about crochet braids that you would like to know, let me know and I will update the post. I know this a old post (the power Google for useful information)…but do you put a satin cap or something over your hair at night? I know the hair I’m getting put in is a loose curl pattern but just wanted to know if you have any tips. Did you comb or brush out the hair when you washed it? can you wash the bulk hair? Hi Nichole! Yes, I have washed my hair with the bulk hair in. I mainly focus on my scalp with a cowash (if you have a scalp massager, that helps) and let the product rinse through the hair. I do not disturb the bulk hair at all. I also let it air dry and it returns to its shape once dry. I am dying to get these. Right now I have a short fro. How long should my cornrows be to achieve a crochet style? Awesome. Thanx. I still have to grow it out some more. Its longer on tip than on the sides. But I want to be able to wear them up but have my sides and back faded real low. If I wanna achieve something like that should the cornrows be like to the middle of my head? Hi, just wondering am I able to get human hair crochet and if so what kind do you suggest? I am looking for versatility. Hi! You can use any type of hair for crochet braids–it all depends on the style you’re trying to achieve. If you want the curly Marley look, you can get straight human hair and actually use styling products, curlers, and heat to achieve that style. If you don’t want to curl the hair yourself, you can buy human hair that’s either already wavy or curly. You can also wear it straight (you’d have to buy hair that’s already straight, or use a flat iron on curly hair). The only reason I would caution against using human hair is it is so much more expensive than synthetic hair and crochet braids last on average no longer than six weeks. But if you are interested, you can find a variety of human hair at http://www.gmbshair.com/hubrha.html?gclid=CjwKEAjw2cOsBRD3xNbRp5eQxzYSJADZGYbzb78zlWm_9_IrV4R12jlyZwj73BgSxtapj1Qgi5PmixoC0v_w_wcB. Hope that helps! Thank you for your help and your timely response! Hi! Can you swim in crotchet braids? Hi! It depends on the type of crochet braids you have in. If you’re using pre-braided strands, absolutely! They won’t unravel or detangle. If not, and you’re using loose bulk hair, I would find a way to pin the hair up (if curly) to swim. If using bulk straight (Kanekalon or Marley) hair, I wouldn’t recommend swimming with them in at all as straight bulk hair tends to matte together. This advice is for synthetic hair. If you’re using human hair, you should be able to swim regardless of what type it is–the hair will behave like human hair does when wet. Probably 6 packs. I used a little over 2.5 packs. The synthetic hair itself will take about an hour to 2 hours to fully dry if you towel-dry or dry with a t-shirt first. You real hair underneath may take a couple of hours. I’ve tried a couple of ways, but my best results happen when I wet my entire head with luke warm water (hot water will dry out the synthetic hair), apply co-wash directly to my scalp and real hair, use a scalp invigorator or pads of my fingers to cleanse, and rinse. That’s it. I try not to disturb the synthethic hair that much and will separate gently with my fingers as I’m rinsing to make sure the synthetic hair doesn’t tangle. Thanks for the education. Love your style. Can you tell me the difference between water wave and bohemian hair. I am getting mine done Friday and am not clear about the difference between the two types of hair. Thank you! Water wave is a slightly looser curl. Bohemian will look like a really defined wash and go if you had 3c hair for example or a 3 strand twist. Water wave almost looks like a bomb twistout. I believe you said yours is water wave. I love your look. I am a professional and want to give my soft hair a rest to grow. In your opinion is the water wave or bohemian more professional and which would look the most natural. This particular look is water wave. I believe I have another post that shows the bohemian look (http://dallernaturel.com/2014/08/20/diy-crochet-braids-2-freetress-bohemian-bulk/). I’m an attorney and I’ve worn both to the office and court, so both work for professionals, in my opinion. I think the bohemian looks more natural on me, but that’s because my hair is coarser in texture (except for my hairline, which is quite fine and silky in texture) and mostly type 4. If you have a naturally looser curl or silkier texture (3b, 3c, or a silky 4a), the water wave would look more natural. You are awesome! My hair is very soft and needs a rest. I will go by the hair supplier and review both. Thanks and God bless. Hi – I’m sorry you had to go through that ordeal! Typically, before I install crochet braids, I make sure my hair is fully prepped and moisturized to endure the fact that my hair will be basically untouched for a few weeks. That means I (1) do a pre-poo (usually with coconut oil), (2) shampoo to thoroughly cleanse (as your hair won’t be fully washed again for several weeks), (3) condition and deep condition, (4) use the LOC method, and (5) apply a leave-in protein treatment (I like Aphogee’s leave-in protein spray) to make sure my strands stay strong enough for the duration of my protective style. All of this is done, as well as a thorough detangling, before I start cornrowing my hair to lock in the moisture. Also, depending on the type of hair I’m using for the crochet braids, I will co-wash my hair to add back moisture in 2-week intervals (note, you can’t really do this with Marley hair that was rolled because you will have to re-roll it). When uninstalling, I repeat the process again (pre-poo, shampoo, deep condition, LOC, protein) before attempting my next style. In the pre-poo stage here, though, I also start finger detangling once the coconut oil and water has saturated my hair. If you kept your hair moisturized for the entire time you had braids, it shouldn’t be that tangled and it shouldn’t matte. Moisture is the key to keep your hair from matting. Hi. Thanks for all of the information! I would like to see a side by side comparison of water wave and bohemian….Thanks in advance. Thanks, Trina. I’ll keep that in mind! Hey what was your braid pattern? I have 25 braids in my braid pattern, im using freetress waterwave 26′ inches how many packs do you think i need? Hi Destiny – that depends. Are the 25 braids all going straight back or only halfway and joining into fewer braids in the back? Are you using the full length of the 26″ pack or cutting in half for a shorter style? How many times do you plan to split the hair (2-3)? Depending on what you plan to do, the answer could range anywhere from 4-12 packs for coverage. For example, I typically have about 13 braids across going halfway back and joining into 6 braids at the back. I also wear shorter styles so I cut the hair in half. If I split 3x, I only need 2.5 packs, but I’ll need an extra pack if I only split each strand twice. You also want to be mindful of volume…too much hair can make crochet braids look so unnatural.